Constant working: 10 hours for day session or 5 hours when IR-LEDs are on in night mode. If you're troubled by short battery life of Reolink Keen even though you just replace the batteries with new ones, you may refer to the troubleshooting tips listed below to solve the problem. If you frequently hear the audio warning or find a lot of intermittent recordings in Playback page, it indicates that the PIR alarm is triggered too often. Note: Pets and hot winds can also trigger the alarm. 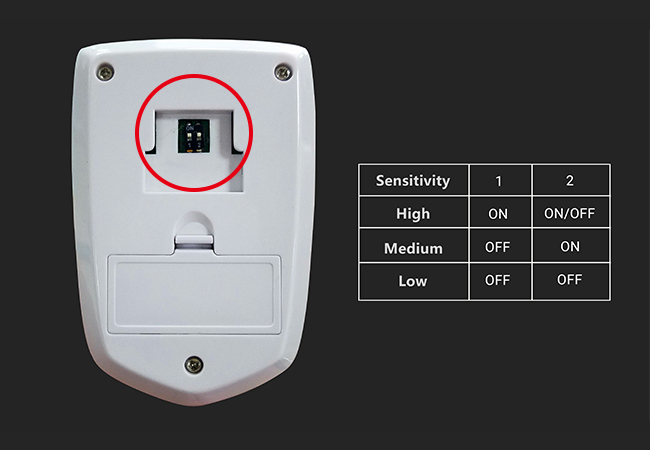 Adjust the sensitivity of the PIR sensor illustrated in the picture below. Configure the alarm schedule to fit your needs more precisely. If you log in to your Reolink Keen and watch live view frequently, the camera will continually go to working state, and the batteries will be consumed more rapidly. Solution: Extend the battery life by only visiting the camera when necessary. Batteries from different brands or manufacturers may have distinct performances. Solution: It's suggested to use batteries from Panasonic, Gold Peak.